The 1st District moved one step closer to having a whole new park space as City Council voted unanimously Tuesday night to convert one of the city’s most dangerous intersections into Robert Gumbiner Park. In order to do so, the council’s vote will eliminate the three-way intersection at 7th Street, Martin Luther King Boulevard (MLK) and Alamitos Avenue by stopping the flow of southbound traffic on MLK at 7th Street and adding green space between the Museum of Latin American Art and St. Anthony’s High School. The project will also amend the flow of traffic on 6th and 7th streets west of Alamitos, changing them from one-way streets to two-way streets. 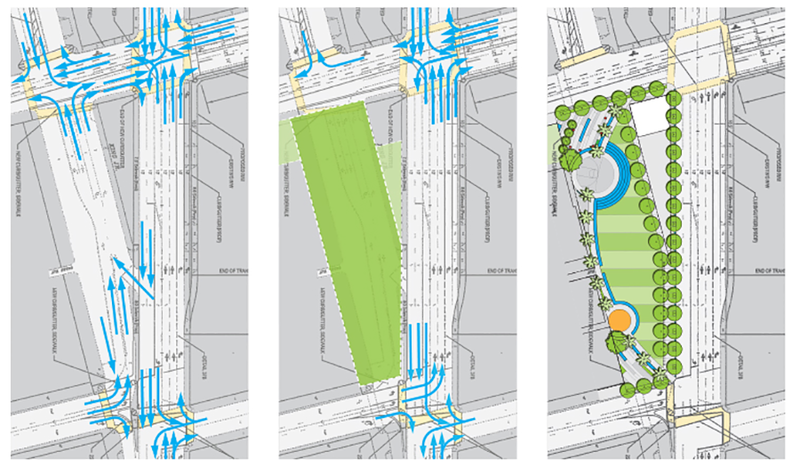 The idea to turn the intersection into a park and design for the new space was originally developed by Brian Ulaszewski of City Fabrick in 2007. The park will add nearly a full acre of park space to a neighborhood that has none within a 1/2 mile walking distance of the proposed site. Vice Mayor Suja Lowenthal took time to recognize Ulaszewski and others for their efforts to make the park a reality. The dearth of greenery allowed the City to apply and qualify for grants from Prop 84 funds ($2.83 million) to develop park space and from CalTrans ($900,000) to “improve the geometry of the intersections.” The estimated total cost of the park is just over $2.4 million with an anticipated annual cost to the general fund of $25,000 to pay for youth programs, landscaping, utilities and supplies. In 2010, a citywide study of intersections with high collision rates found those involving the four streets in question to be hazardous. According to the proposal approved by the council, the complicated intersections resulted in numerous collisions with the most common injuries involving cyclists and pedestrians.The project will effectively close off vehicular access from MLK and rezone it for pedestrian and cyclist use. Austin did however question the validity of deeming it a “park.” Director of Public Works Ara Maloyan noted that provisions in the California Vehicle Code allow local authorities to close any street or alley in its jurisdiction to vehicle traffic when it’s no longer needed. Additionally, he pointed out that the City adopted a similar resolution in 1997 that allowed for a park or other recreational use to serve as justification to closing a street. Put simply, “It quacks like a park, it walks like a park…it is a park,” Maloyan said. The conversion of 6th and 7th Streets into two-way streets between Atlantic and Alamitos Avenues will come at a cost outside the estimated budget. Under the proposal, 53 net parking spaces will be eliminated with all spots on 7th Street between Alamitos and Atlantic set to be removed. Additionally, the intersection of Atlantic Avenue and 7th Street will need to be widened to allow for the turning radius of buses. To convert the intersection, the city will have to carry out a land exchange with the Archdiocese of Los Angeles. The city will vacate nearly 230 square feet of sidewalk on the west side of MLK in exchange for 69.5 square feet of real estate on the south side of 6th Street. The move is necessary since State law provides that in the instance of any vacation of land, the adjacent property owners—in this case, St. Anthony’s—would be entitled to half of it. The land trade will keep access open to the Armory, which will also have access to the closed portion of MLK during its annual exercises. A public hearing for the the planned vacation of public right-of-way is scheduled for March 3 at 5:00PM. 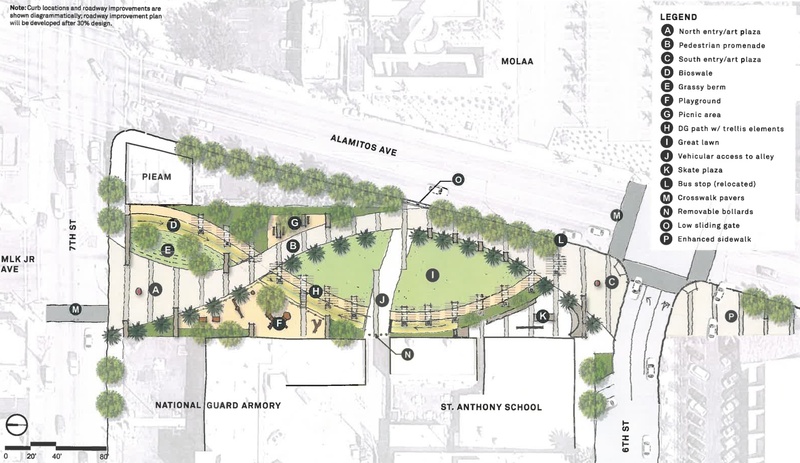 The vote also approved the multi-million dollar Alamitos Park Project which will improve street conditions and storm drains on the previously-mentioned streets. Originally named Armory Park, Robert Gumbiner Park gained its namesake after a proposal in 2014 by Lowenthal and then-Vice Mayor Robert Garcia to name it after the philanthropist who contributed the bulk of the funding needed for the formation of MOLAA, with over $40 million in donations. The 36,590 square-foot park will include art pieces donated by the city, a playground, a skatepark and space that can be utilized for community programming like movies in the park or open-air concerts. Once completed, the park will directly serve some 32,000 people that live within walking distance of the site.